Russia will deploy Iskander missiles in its Baltic Sea territory in response to plans by the United States to build an anti-missile system in Europe, President Dmitry Medvedev said on Wednesday. Russian President Dmitry Medvedev vowed to deploy missiles near Poland in response to U.S. plans for a European shield during a speech on Wednesday. ((Ivan Sekretarev/Associated Press))Russia will deploy short-range missiles in the Baltic Sea region near the border with Poland in response to plans by the United States to build an anti-missile system in Europe, President Dmitry Medvedev said on Wednesday. 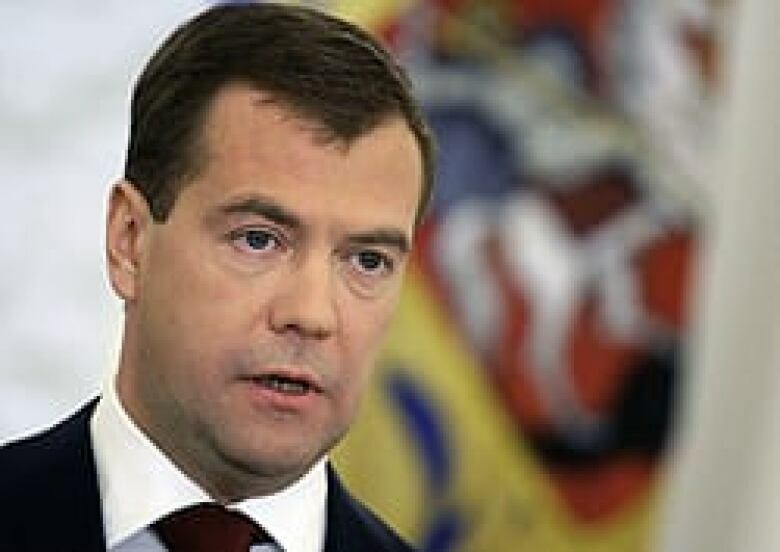 The proposed U.S. anti-missile system, which would include 10 missile silos in Poland and a radar station in the Czech Republic to help detect and shoot down any ballistic missiles, threatens Russia's national security, Medvedev said in his state-of-the-nation address on Wednesday. "To neutralize — if necessary — the [U.S.] anti-missile system, an Iskander missile system will be deployed in the Kaliningrad region," Medvedev said. "Naturally, we are also considering using for the same purpose the resources of Russia's navy." Czech Foreign Minister Karel Schwarzenberg said if Russia went ahead with the deployment it would worsen the atmosphere for any international dialogue in the region. Lithuanian President Valdus Adamkus issued a statement saying Russia's plan was beyond comprehension. But in Poland, Prime Minister Donald Tusk played down the plan. "We have been used to the fact that Russia growls every now and then," Tusk said. "I would not give too much meaning to this declaration." Russia will be scrapping its plans to decommission three Cold War-era missile regiments and will be developing systems to electronically jam elements of the proposed anti-missile system, he said. "Mechanisms must be created to block mistaken, egoistical and sometimes simply dangerous decisions of certain members of the international community," he said. Medvedev did not disclose how many of the short-range missiles will be deployed or whether they will be fitted with nuclear warheads. Russia's nuclear arsenal has the capability to hit targets anywhere in the world but the Iskander missiles have a range of up to 400 kilometres and pose a greater threat to eastern Europe than the United States. The "new configuration for the military forces" in relation to Russia's missile plan have already been approved, he said. 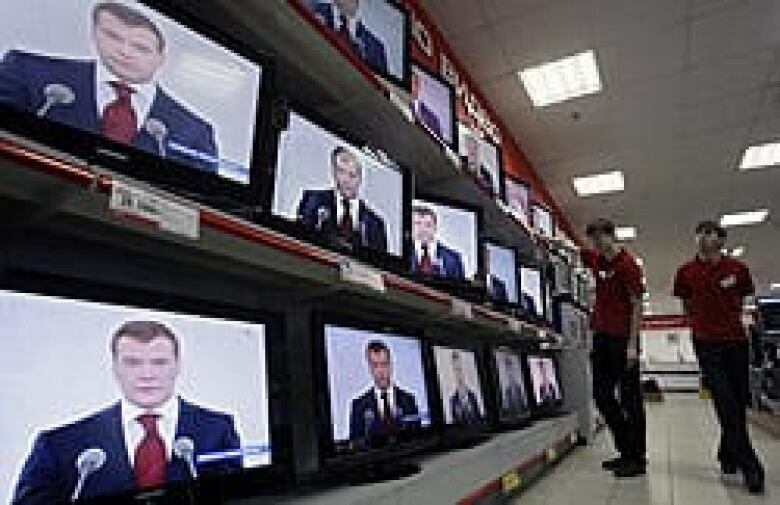 Shop assistants watch Russian President Dmitry Medvedev making the address to the nation on Wednesday. ((Mikhail Metzel/Associated Press))During the speech, Medvedev painted Russia as a country threatened by growing Western military might. "From what we have seen in recent years, the creation of a missile defence system, the encirclement of Russia with military bases, the relentless expansion of NATO, we have gotten the strong impression that they are testing our strength," Medvedev said. President-elect Barack Obama's administration must take steps to improve U.S. ties with Russia, he said. "I stress that we have no problem with the American people, no inborn anti-Americanism and we hope that our partners, the U.S. administration, will make a choice in favour of full-fledged relations with Russia," Medvedev said. Russian-American relations have been increasingly tense and were driven to a post-Cold War low by Moscow's war with U.S. ally Georgia earlier this year. "Medvedev was very assertive in his delivery," said Ronald Smith, chief strategist at Alfa Bank in Moscow. "[He] appeared to be staking out strong positions on various issues ahead of the entry of the new American presidential administration." During the speech, Medvedev also proposed extending the presidential term from four years to six to allow the government to more effectively implement reforms. He said the change would be phased in first as five years and then bumped up to six and that the parliament's term should also be extended from four years to five with a requirement that cabinet report to legislators more regularly. The proposals are Medvedev's first major initiative to amend the constitution since he was elected in March to succeed his longtime mentor, Vladimir Putin. Putin has also said in the past that the presidential term should be increased.